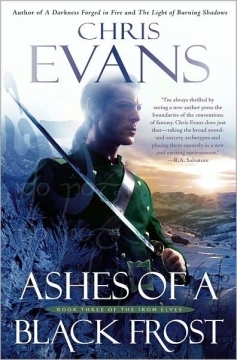 While most fantasy novels and series hew closely to a medieval setting with swords and catapults, Chris Evans’ Iron Elves series offers a unique and fun twist – elves, dwarves and humans fighting with muskets and cannons. The third book in the series – Ashes of a Black Frost – was just published in hardcover. And so Konowa sets off from this Canyon of Bones, pursuing his freedom from a curse that has cast his life in darkness. For though his long, violent trek may indeed lead him to his destiny, he is ill prepared for the discovery he will make . . . with the fate of the Iron Elves, and the world, hinging on the courage of one wrathful elf.